This one is so easy it doesn’t require much explanation. The container is upcycled – it was a large plastic jar of almonds that we bought from Costco. 1) I cut scrapbook paper to fit where the label used to be. 2) I used spray adhesive to attach the paper. 3) I added a chalkboard label (from Michaels). I used (erasable) chalk marker instead of chalk, so it won’t smear. 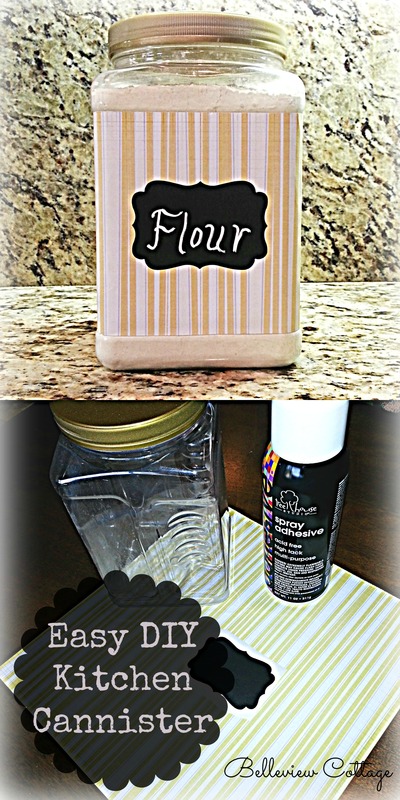 Enjoy this easy project! Send me your pictures of your finished product. How clever! A great look at a great price! !